Days after his release from house arrest, Hafiz Saeed, a UN-designated terrorist, has been issuing political comments and statements against the United States and Israel on the issues of Jerusalem and the future of the Palestine State. The co-founder of Lashkar-e-Taiba and the chief of Jama'at-ud-Da'wah recently reacted strongly to U.S. President Donald Trump's announcement to shift the American Embassy to Jerusalem, terming the decision pro-Zionist and anti-Muslim. He made these statements in both Lahore and Karachi. He warned President Trump that his recognition of Jerusalem as the capital of Israel would evoke a strong reaction from the Muslim world and could possibly lead to a declaration of war across the Middle East. Saeed, who was released from house arrest on November 23, has led anti-US demonstrations at the Markaz al Qadsiya in Lahore and attended a Friday sermon at the Markaz Aqsa in Gujranwala. On December 12, in Karachi, he stated that member countries of the International Human Rights bodies were active in trampling human rights and also condemned the silence of these institutions to the "oppression" of Muslims in Palestine and other parts of the world. He further added that Israel in Palestine are "committing atrocities" and urged the Government of Pakistan not to become the victim of external forces and stand with Palestinians in their "freedom struggle". 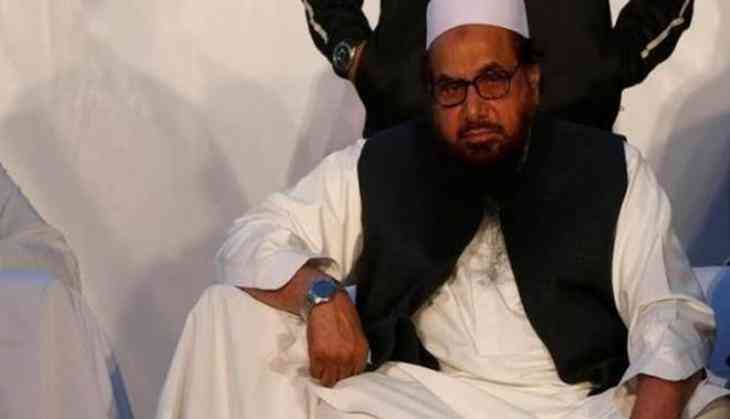 Saeed and the JuD were already banned by the UN while U.S. has put USD 10 million bounty on the arrest of Hafiz Saeed. During interactions with delegates at Jama Masjid Al-Qadsiya in Lahore, Saeed termed Israel as a cancer which had afflicted unarmed Muslims in Palestine for more than half-a-century. He claimed that President Donald Trump's announcement regarding recognition of Jerusalem as capital of Israel had sabotaged peace all over the world. He alleged that Israel in Palestine was "using chemical weapons" against "unarmed Muslims" but the world institutions were ignoring it. Saeed also reportedly addressed a training session for JuD cadres at Jamia Masjid Al Quds in Rawalpindi. Despite spreading religious hatred during open gatherings in major cities across Pakistan, the government fails to act against perpetrators of terror like Hafiz Saeed.